I actually won something wonderful! While years’ of contests and drawings had previously yielded only junky little things, this time the prize was something that was high on my bucket list! A trip for two to Athens and the islands of Mykonos and Santorini. The package, provided by Trafalgar Tours, was called the Greek Island Hopper and included several days in Athens, three days in Mykonos and three days in Santorini. Perfect. Best of all it included transfers, baggage handling and all the annoying details that detract from the pleasures of travel. After the usual red-eye flights, my daughter and I were met at the Athens airport by our Trafalgar tour director, who delivered us to the Metropolitan Hotel, where welcome included ouzo, cheese and olives. After a brief rest we took the complimentary shuttle provided by the hotel into the heart of Athens, feasted on a late breakfast/brunch at an inviting restaurant and gave ourselves up to a few hours of picture-taking and window-shopping. The shopping in Athens is amazing: outstanding leather goods, eye-popping jewelry in 18 karat gold and trendy furs, priced far less than they would be at home. The next day was for serious sightseeing. By coach we traveled to the Panathinaiko Stadium, home to the first modern Olympics in 1896, to the temple of Olympian Zeus, past Hadrian’s Arch, the National Gardens and other sites. The highlight involved serious climbing: The Acropolis, the ancient citadel high above the city, the place where democracy was born and where the remains of age-old buildings remain. 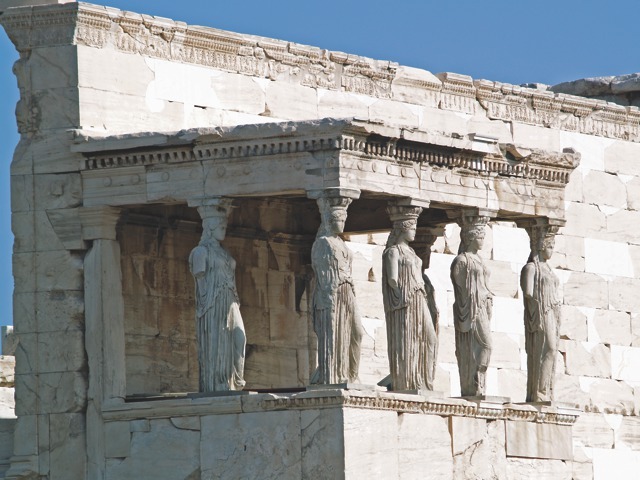 The famous “Porch of the Caryatids (maidens) with six draped female figures as supporting columns. It was amazing to stand on this hill, where so many great scholars and writers – Plato, Aristotle, Archimedes and Pythagoras among others – walked and talked and discussed philosophy and politics and the issues of the day. On this day, armies of tourists from all over the world were present, to contemplate the grandeur of this ancient civilization – and to take photographs from every imaginable angle. After descending from the Acropolis, the husband of one of our American companions (he had refused to make the climb, saying it was too much work) asked: “Well, was there anything to see up there?” I didn’t wait to hear the answer. What was the point? Later, we visited the contemporary New Acropolis Museum, built to house thousands of antiquities removed over the centuries during various archeological digs on the Acropolis. Our favorite museum – and there are several – was one of the world’s greatest, the National Archaeological Museum, home to important artifacts dating from pre-history to late antiquity. Among the most dazzling were the golden funerary masks of deceased Mycenean nobles – especially one that’s in so many school textbooks and mistakenly labeled as the mask of Agamemnon. Equally stunning was the majestic bronze statue of Zeus — or Poseidon, scholars aren’t quite sure. The rest of our time in Athens was spent enjoying the same things Athenians enjoy: delicious mezze (small dishes like Spanish tapas) at cozy taverna, sipping frappé coffee (the Greek version of iced coffee, topped with milky foam) at outdoor cafés, strolling the commercial streets, with an occasional look at the Monastiraki Flea Market, where anything from cheap T-shirts to hand-painted icons to gold jewelry could be found. Moving on to Mykonos by fast ferry, we landed at the old harbor, where we could see at once that of all of Greece’s 227 inhabited islands, this was the one dedicated to non-stop fun. In the early 1960s shipping magnate Aristotle Onassis “discovered” Mykonos, brought Jackie Kennedy here – and soon the island became an exclusive playground for celebrities like Grace Kelly, Brigitte Bardot and Sophia Loren. Fresh seafood served with this view. What could be better? Today it’s a bustling, bursting-at-the-seams place with glorious beaches, waterfront cafes, shopping in every price range (both international brands and local crafts), water sports and delicious food (especially fresh fish). The largest town on the island is Mykonos town, also known as Chora or Hora; a few miles inland is the village of Ano Mera. 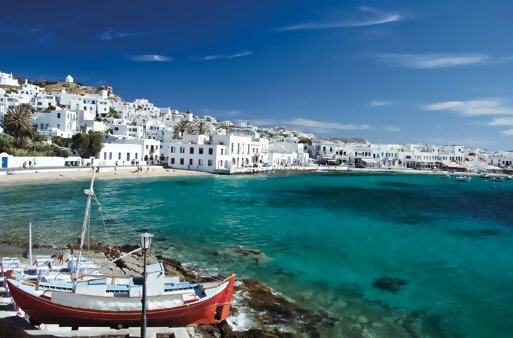 The subject of many paintings by local artists, Mykonos is a feast for the eyes, with its azure waters, houses painted white with brightly colored shutters, bougainvillea trees in bloom, iconic windmills and colorful fishing boats. Overlooking the town are the famous white Venetian windmills (Kato Myli), the first landmark passengers see when ships and ferries approach the harbor. Built by the Venetians in the 16th century, they were used to grind wheat until the early 20th century. Some have been restored, all are popular subjects for photographers and artists. Part of our trip package was a walking tour that included the Kastro (castle area), the oldest part of town. Here we saw a workman whitewashing the Byzantine church Panaga Paraportiani, the oldest in Mykonos – and perhaps the most photographed church in Greece. Though building started in 1475, it’s really a group of five smaller churches, constructed over a period of time and completed only in the 17th century. Nearby is the Myknonian Folklore Museum, displaying period furniture (most from the 19th century) that gives a sense of how middle class residents lived. Also here: tools, weapons, lighting devices, tapestries, ceramics, photographs and related artifacts. Facing the old harbor is the Archaeological Museum, which houses collections from various excavations. These include funerary statues and grave stelae, pottery, clay figurines, jewelry and small objects – all dating from the 2nd and 1st centuries B.C. Of special interest is a large relief from the 7th century B.C., decorated with scenes from the capture of Troy: the descent of Greeks from the wooden horse and warriors attacking women and children. Our favorite stroll was through photogenic Little Venice, so named for the medieval houses with balconies that overhang the water. Pirates frequented Mykonos during the 16th and 17th century, and it’s believed that they loaded and unloaded their booty in this area. We saw boutiques, restaurants and cafés – and Petros Pelican, the Mykonos mascot. The first Petros was rescued after a storm in 1954 and lived on the island for more than 30 years. When he died, the loss was felt so deeply that a replacement was soon found – and a tradition was established. In the center of town, in the area known as Tria Pigadia, was the Aegean Maritime Museum, where exhibits include models of ships from the pre-Minoan period to the early 20th century, navigational equipment, maps, a collection of ancient rare coins with nautical subjects and thousands of rare books. In the garden are reproductions of ancient gravestones from Delos and Mykonos related to shipwrecks and sailors lost at sea. Near the museum, our guide pointed out the famous Tria Pigadia, the three wells for which the area is named. According to legend, if a virgin were to drink from all three wells, she would find a husband; a more recent story says that if a visitor drinks from the wells, he or she will return. No one in our group was willing to test the truth of these stories. Touring completed, we headed for one of the harbor-front restaurants. At Rouvera, the waiter brought us freshly caught fish on a platter. We made our choice, a whole sea bream and asked for it to be grilled, “cleaned” (filleted) and beheaded, as we are not among those foodies who believe the head is the best part. The fish was perfectly cooked, perfectly delicious, accompanied by crisp French fries and chilled Mythos draft beer. We lingered, enjoying the view and using the free Wi-Fi. We enjoyed the experience so much, we returned the next day to the harbor to dine on huge grilled prawns (langoustines, really) at the neighboring Music Café. Meandering away from the harbor, we visited an upscale jewelry shop, where the owner was pleased to share stories about his hand-made museum-quality pieces, though it was clear we were “only looking.” We also browsed some of the island’s many art galleries and admired original works by local artists. A cozy corner for lounging at the El Greco Hotel. 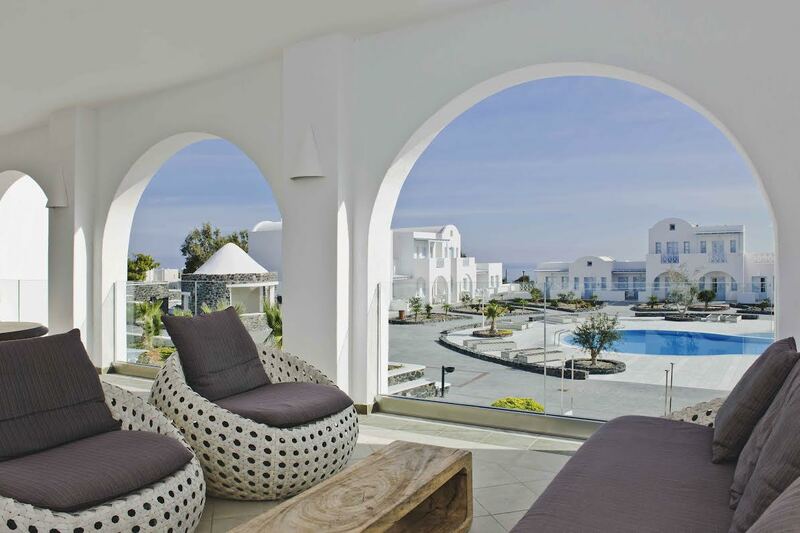 Our hotel, the El Greco, was perched high on a cliff, a vision in white set against a blue sky. Like something from a fairytale, it made us wish we had more than three days to enjoy the pools, the views and the atmosphere that so far removed from everyday life. Of course, we had to explore the center of town, where we found one budget-busting shop after another — and one restaurant with dazzling cliff-top views after another. We yielded to temptations in every shape and form, as much as our credit cards would allow, savoring memorable meals and choosing souvenirs that would be enjoyed in the years to come. When we could do no more, we relaxed around the picture-perfect pool. The Pergola restaurant at the Iconic Santorini was the perfect place for a farewell dinner. The final night of our trip included dinner at the Iconic Santorini, a 22-room boutique cave hotel in the whitewashed village of Imerovigli. This remarkable property has been re-created from actual homes and shops set into the cliff and transformed into an ultra-luxurious retreat. As we feasted on the chef’s multi-course tasting menu in the resort’s Pergola restaurant, Nature provided a glorious sunset. 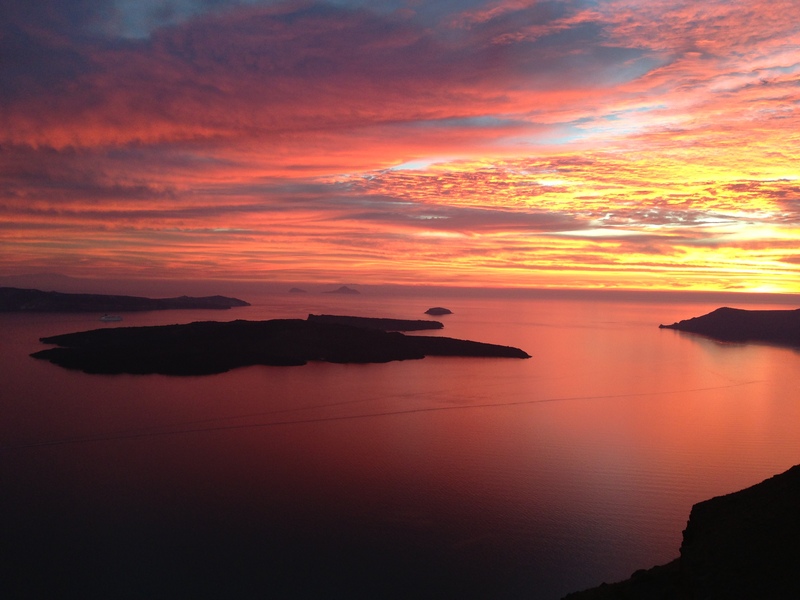 Sunset view from the Iconic Santorini. Sublime. After experiences like that, is it any wonder that I did not look forward to the long flight home?